Do we want to force children to read today or do we want them to develop a love of reading for the future? This question highlights one of the differences between academics and play-based learning in children’s early years. “You can give children a worksheet or you can give them blocks, and the fact is, children will learn more with the blocks than they ever would with the worksheet,” says Dr. Langford. “Everybody needs to play, even adults, but we know it’s even more important in the early years. Most people understand the importance of play for children; but the mistake parents and caregivers might make is to think play just means fun. Anxious for children to be ready for school, adults might push children to start doing drills, reading letters, and writing the alphabet. Or, they can sit behind a desk and practice writing letters on a piece of paper. “We want children to have opportunities to practice in all developmental areas (cognitive, social, emotional, and physical). A rich program is one with lots of different materials in which children can engage in a range of experiences to help them grow in all those areas. Children should have activities that promote all these skills both inside and outside,” according to Dr. Langford. It’s also important for caregivers to play and communicate with the children to increase their learning. “Research shows the single most important indicator of quality of early childhood centres is teacher-child interactions. You can have the best materials, but it is not enough. It’s the interaction. Play is social, and our role is central to play,” explains Dr. Langford. 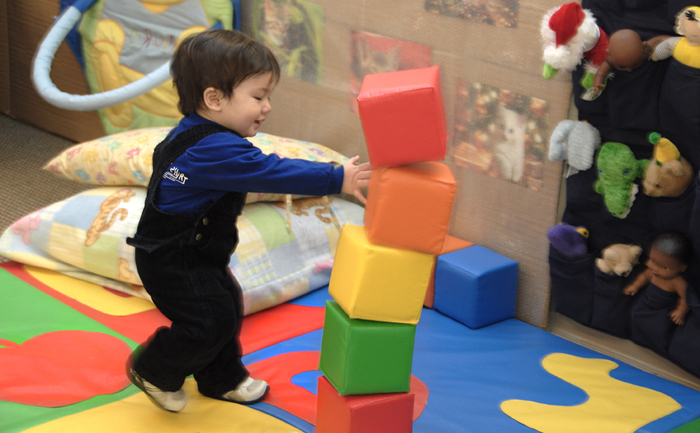 According to Dr. Langford, play-based learning also means better behaviour in children. Spending so much time trying to ‘manage’ children (sit up straight, do this or do that) creates stress and negativity. If we force children to sit too long during “circle time” or do activities that are too difficult for them (and then teachers end up doing it for them), children can’t “self-regulate”, meaning they aren’t able to control their emotions and this results in challenging behaviours. However, if we allow children to play and learn at a level that fits with them, they will succeed. For Dr. Langford, “half of the behaviour issues I see in centres are due to too many routines, sitting around, and too few positive interactions with adults. If all this changed, there would be no behaviour issues.” She suggests large amounts of time allocated for play with lots of interaction between caregiver and children and keeping group times like circle very short. Below is a list of just a few strategies you can implement for more play-based learning in your program. Take the time to observe and record the differences in behaviour; you may realize the success of learning through play after only a couple of weeks. Ask questions and engage verbally with the childrenPlay with the children! Dr. Rachel Langford is the director of the School of the Early Childhood Education at Ryerson University. She has many years of experience working with different age groups (toddler, preschool and school-age) in a variety of early childhood settings including parent cooperative, preschool, and child care. She has extensive experience supporting children with special needs in both integrated and specialized settings. Dr. Langford is also co-author of the textbook, Inclusion in Early Childhood Programs: Children with Exceptionalities (Thomson: Nelson, 2006) and the editor of the Checklist for Quality Inclusive Education: A Self-Assessment Tool and Manual.